Thanks to all of you who have been supporting Natalie Remedios Cimprich with your words, gifts, and private prayers. Her husband Patrick's funeral Mass is today at 11:00 here at St. Louise. Our entire 6th grade class will be attending and our Chorale choir will be leading the singing. This short article for Catholic school parents gives some advice on how to talk to your children about death and funerals, focusing on discussing these three key points: a person has a soul; it's okay to grieve; the faith that is evident at a funeral Mass binds us together as the Body of Christ. On that last point, isn't it wonderful that we have faith and know that there is eternal life after this life on earth? It's already difficult enough to handle the sorrow of a loved one's passing, but I can't imagine how much more difficult it would be if we didn't have our Christian faith. We attend Patrick's funeral Mass today to grieve in our loss of Pat while simultaneously celebrating his life. Moreover, we gather so we may give praise to God for Christ's victory over death and to seek strength in our belief in Jesus's resurrection and the heavenly afterlife that can be ours. After today, teachers will start scheduling the November Parent-Teacher Conferences in which all school parents must participate, which is why TODAY AT NOON IS THE DEADLINE for parents to choose their preferred day and time to hold their conference. Please refer to the recent email from me that contained the link of the Parent Survey, where you are to choose the more convenient conference dates/times. After 12PM today, we'll close down the survey. The teachers and I will sit down and set up Parent-Teacher Conference schedules based on your requests. We will notify on November 2, about your confirmed Parent-Teacher Conference date. It's a Wonderful Life at St. Louise - our 2018 school Auction - is taking dinner reservations for just two more weeks. Please RSVP now at this link. 2) Helping us pay for our upcoming plans to makeover our parish hall so we can hold our school musical on campus, as well as have a better performance area and more seating for school concerts. For more information on this year's Fund-a-Need, please watch our slideshow, narrated by some of your kids. The Parent Survey - which Mr. Fitz emailed you on October 11 - closes today at 12:00PM. This survey is where you request the best date/time for your required Parent-Teacher Conference, so please make sure to complete the survey by noon! Next Saturday, October 27, from 8AM-12PM, parents are invited to join our Fall Fix-Up and help beautify the school and parish grounds. We'll be raking leaves, pulling weeds, and doing other yardwork as directed by our head volunteer landscaper, Jeffrey Hummer. Please email Jeffrey if you are attending, so he knows how large the work force will be. At the end of the morning, Mr. Fitz will feed all the workers lunch in appreciation. This isn't the week for peppy bulletin messages - as we mourn the loss of Patrick Cimprich from our community. It has been wonderful to see the support offered and provided to Natalie and Simone since his passing. And, that's one of the reasons we are in a community like this - we are here for one another. As we near the day of our largest fundraiser, you'll find that the list gets longer and longer regarding things to note about It's A Wonderful Life at St. Louise . Hang in there! We are nearly there! Be there for each other, and pray for each other. If you purchased your tickets at the Deck Party back in May - all you need to do is send an email listing who you would like to sit with to auction@stlouiseschool.org with the subject line "Reservations." If you need to purchase tickets, please click on this Registration Page. Within this page, be sure to note which meal you would like to enjoy (See Red Envelope Flyer for choices this year! ), and under "Special Accommodations," please note with whom you would like to sit. If you are new this year, and don't know who you want to sit with, we'll seat you with other families in your grade level. Auction Night Volunteers: We need just 2 more Auction Night Volunteers. These are our dedicated volunteers who make the night run smoothly - they handle registration, raffle ticket sales, live auction spotters, runners, item distribution, etc. If you have specific questions about how volunteering works on the night of the big event, please reach directly out to Mike Kirby. Or, simply sign up here. Morning Set Up Volunteers: We need about 20 volunteers to set up all of the items for the auction from 8am until noon on Saturday morning, November 10. 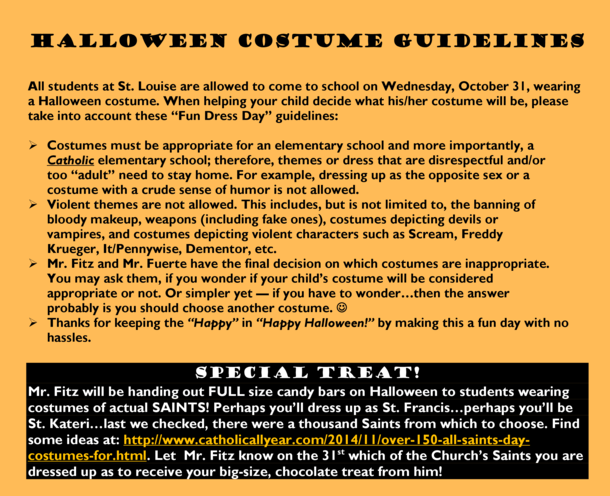 Please email auction@stlouiseschool.org to join in the fun! You'll get to see all of the wonderful items that will be up for sale ahead of everyone else! Pre Event Volunteers: Also, if you are here any day or evening, and have 30 minutes or more to volunteer (day or evening), I have all kinds of jobs that need to be completed over the coming weeks. Just send an email to auction@stlouiseschool.org and let me know when you can be here and for how long and we'll help you check off your volunteer time. Thank you for all you do - you are appreciated! Because of our growing concern for more and more students missing school for reasons other than illness or family emergencies, and because this problem affects both the teachers' workloads and those students' academics and anxiety of being able to catch up, we have strengthened our school's absence policy. Please go to page 4 of the POLICY HANDBOOK on our school website where you'll find the entire Absence Policy spelled out. Our website also has a link to the new Planned Absence Form that you and your child must present to the teacher at least 5 days prior to certain planned absences. Thanks for your cooperation! We were sad to hear that our school bookkeeper, Amy Thielman, will soon be leaving us to work full time at another company. Amy has been a major part of our administrative team since she joined us two and a half years ago. She not only has been a tireless worker to oversee the various financial processes at school, but her efforts have helped us create new ways of doing financial transactions, such as an increase in how parents can make online payments using credit cards and electronic fund transfers. With Amy's impending departure, we are announcing a part-time bookkeeper position available at St. Louise. This position enjoys a flexible schedule, allowing the bookkeeper to work three full days a week or four to five shorter days per week, for a total of 25 hours weekly. The bookkeeper's work schedule mostly follows the school calendar, with limited hours during school vacations. The candidate chosen for this position will be trained by the outgoing bookkeeper and must be available to begin training by no later than December 1, 2018, with the ability to completely take over the position by no later than February 1, 2019. (Earlier training and start dates are possible.) A compensation range of $25 to $35 an hour will be based on experience. This position does not offer health benefits. A candidate is desired who has as an associate degree in accounting. Bookkeeping experience is required, as are strong computer skills with accounting software and database management, including proficiency in QuickBooks and Excel. The ability to work as a team player and manage multiple tasks simultaneously is essential. The school bookkeeper oversees the processing of tuition, cash deposits, fee collections, and bill payments. Other duties of the school bookkeeper include preparing reports for our school's fund raisers, and assisting the school's finance committee in preparing an annual budget. For a more detailed job description, and an application form, please go HERE. Contact Dan Fitzpatrick if you have any questions. Thanks to Lilibeth Tiotuico, Trinette Kuester, and Victoria Bermel for their assistance during last week's Photo Day. If your child was absent last Wednesday, the Photo Retake Day is November 14. Contact Cindy Wagner if you have questions. NOTE: This Sunday October 21, from 8:30am-12pm in the St. Louise Room (in the original school building), the parish nurses will be offering flu shots for all. Buy Charger Cards & Earn Special Rebate Bonuses! We're stocking up on special bonus rebate offers and special holiday season cards. Start putting a list together of all the treats for Halloween, stocking stuffers and presents you need for the holidays. Special offerings of $5 and $10 cards will be available from October 20 for a variety of popular stores and restaurants, so please stop by the Charger Card window or visit www.shopwithscrip.com to learn more. If you have any questions, please contact St. Louise Basketball Coordinator, Rodney Thomas at rodneytthomas@hotmail.com .